The release dates for two movies starring Lee Byung-hun are likely to be delayed further, local media reported Friday. According to reports, the release date for “The Insiders” has been pushed back to the second half of the year. The movie is based on an online comic series of the same name, with Lee playing a low-life intent on exacting revenge on his former bosses. The movie, which was initially slated for release last year, was held back after Lee was mired in a blackmail case. Two minor celebrities attempted to blackmail Lee using a recording in which he was heard making lewd comments. They have since been found guilty of blackmail. The release of “Memories of the Sword,” in which Lee plays a swordsman who betrays his friends, is also expected to be delayed. The movies are considering release dates, that an actor Lee Byung-Hun appeared in, who was caught into ‘5 billion threat scandal. ‘Memories of the Sword’ the martial arts movie that Lee Byung-Hun shot with Jeon Do-Yeon, Kim Go-Eun, and Junho, finished all shooting in 2013. First they planned to release the movie in winter, but after the ‘accident of Lee Byung-Hun’ it delayed the date indefinitely. Writer Yoon Tae-ho's unfinished web-toon and criminal drama is coming out this November. The film features actors Lee Byung-hun, Jo Seung-woo and Baek Yoon-sik. "Inside Men" is a criminal drama about the loyalty and betrayal of inside men who move the Korean society. The drama was serially published in 2012 but suddenly came to a stop and originates from Yoon Tae-ho's unfinished web-toon "Inside Men". Yoon Tae-ho is also known as a storyteller who brings out the mourning of Korea realistically and some of his famous works are "Moss" and "Misaeng" ("Incomplete Life"). In addition to the writer's storytelling, director Woo Min-ho's creativity and performance of Lee Byung-hun, Jo Seung-woo, Baek Yoon-sik and others are expected to create great results. With the release of this movie in November, a single still of the movie allows for a feel of how it's going to be. Lee Byung-hun stars in the movie as Ahn Sang-goo, a political gangster who has been abandoned after being used by a chairman of a major firm and a politician. Lee Byung-hun is a renowned actor who won 3 Best Actor Awards for "Masquerade" and "A Bittersweet Life". Jo Seung-woo is a passionate investigator named Woo Jang-hoon. As seen in "Marathon" and "The War Of Flower" and "The Assassination", the mighty Jo Seung-woo is back. Veteran actor Baek Yoon-sik who starred in "The War Of Flower", "The Big Swindle" and "The Face Reader", takes on the role of Lee Kang-hee, a member of the weekly editorial. He is the background of politicians and connects them with plutocrats, gangsters and other characters. Lee and other cast members -- Jo Seung-woo and Baek Yoon-shik -- are scheduled to show up for the event, together with director Woo Min-ho and screenwriter Yoon Tae-ho. Lee is yet to fully recover his public image after he was embroiled in a scandal involving younger actresses while his wife, actress Lee Min-jung, was carrying his baby. “Insiders” is a criminal-drama film portraying the loyalty and betrayal among the movers and shakers of South Korean society. The movie is expected to release in November. Here's the TEASER for INSIDE MEN! Actor Lee Byung Hun and Jo Seung Woo, Baek Yoon Shik are appearing as strong characters. Crime drama ‘Insiders’(director Woo Min Ho), which is based on original webtoon of writer Yoon Tae Ho, released 15 kinds of still cuts. 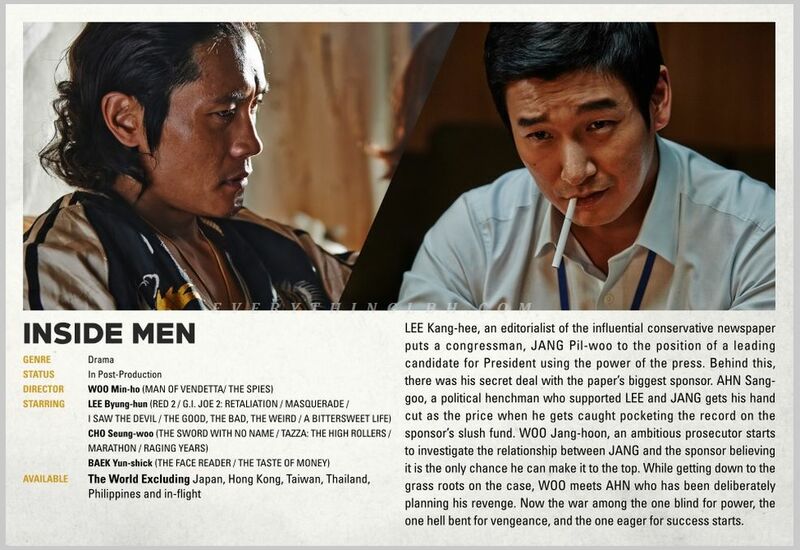 This photos released by ‘Insiders’, which was decided to premiere in November, showed strong characters of politic gang ‘Ahn Sang Goo’ (played by Lee Byung Hun), prosecutor ‘Woo Jang Hoon’(played by Jo Seung Woo) and writer who designs the politic ‘Lee Gang Hee’(played by Baek Yoon Shik).